Many moons ago, we tried a tomato-less corn salsa from Trader Joe’s that I thoroughly enjoyed. It was sweet with just a bit of zing to it, and was good with tortilla chips or just by the spoonful. With it being corn season, I was inspired to try to reproduce it. 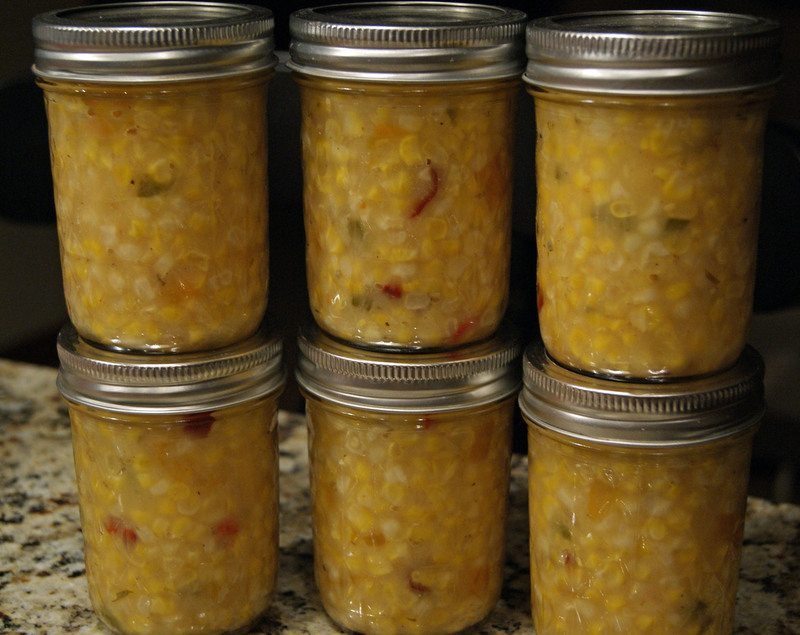 I looked around to see if anyone else had duplicated it, and the closest I found was a twist on a corn relish, which I, of course, then added my own twist to. Cook the peppers and onion in a large saucepan with a little oil until soft. Add the corn and seasonings, and simmer for another 30-60 minutes over a low heat, or until the corn has reached the desired tenderness. If you’re canning it, ladle into jars and process in boiling water for 15 minutes. Otherwise, dig in!